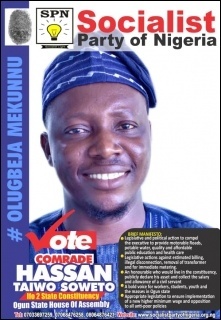 This detention is clearly an act of desperation by the Nigerian state to intimidate Comrade Abiodun Bamigboye, a. k. a. Abbey Trotsky, because of the radical programmes and alternative that he represents. A three day general strike in Zimbabwe was set in motion on January 14 in response to the deteriorating economic situation in the country. The strike was organised by the Zimbabwe Congress of Trade Unions (ZCTU) and local activists as an immediate challenge to the 150 percent fuel price hike announced by President Emmerson Mnangagwa on January 12. The Education Rights Campaign (ERC) wishes to reiterate her principled support for the ongoing strike of ASUU and ASUP. We believe this strike, which is about compelling government to fulfill its social responsibility in terms of funding public education and improving the conditions of education workers, deserves the principled support of students, parents and the labour movement as a whole. The Socialist Party of Nigeria (SPN) hereby welcomes the latest decision of the Nigerian Labour Congress (NLC) to re-start national mass protests across the country on January 8, 2019, in response to the failure of the federal government to transmit the minimum wage proposal to the National Assembly for enactment. Just as recent actions have demonstrated the effectiveness of united struggle of all trade centres and pro-labour organisations, we hereby urge that the January 8 action be jointly coordinated by the NLC in alliance with the TUC, ULC and also the Joint Action Front (JAF). Sudan has been rocked by extensive anti-government protests since December 19, unprecedented in their geographic scope and duration. People in the diaspora have come out in large numbers worldwide in front of Sudanese embassies to showcase their solidarity with the heroic struggle of their brothers and sisters. In contrast, most media outlets in neighbouring countries have been silent about this new stage of the brewing Sudanese revolution, afraid that the collapse of Omar al-Bashir's three decades long dictatorship might provoke a new wave of uprisings across the region. 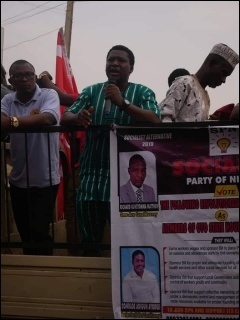 There was an excited response as the flag-off rally of the Socialist Party of Nigeria (SPN) campaign to elect Comrade Hassan Taiwo Soweto as member, Ogun State House of Assembly, Ifo 2 constituency, took place on Saturday 15 December 2018. It started with a symposium at the Olambe Town hall, with about 120 persons in attendance. The symposium started with solidarity songs where the members of the party sang enthusiastically, before the candidate came out to give his manifestoes to an inspiring applause by the audience. The Democratic Socialist Movement (DSM), Osun State Chapter, hereby bemoans the despotic approach of the management and Governing Council of Osun State University (UNIOSUN) to the agitations and demands of the staff unions of the university. We condemn the highhandedness of the Prof. Labode Popoola-led University Management, which has led to undemocratic attacks on the rights of workers in the institution to unionisation, expression and assembly. We call on the Governor of Osun State, Alhaji Gboyega Oyetola, who is the visitor to the institution, and Osun State government, the owner, to stop the university administration in the ruinous path it has taken against staff unions and their leaders. The workers of A&P Foods/pladis Global, Lagos, have embarked on strike action since Wednesday December 19, 2018 when the leadership of the National Union of Food, Beverage and Tobacco Employees (NUFBTE), led by Mr. Lateef Oyelekan (President), on the order of management, suspended indefinitely the branch union Chairperson, Vice Chairperson and Treasurer while five others EXCO members were given final warnings. For more than a month now, since 17 November, France has seen an apparently unstoppable revolt from below. Wearing 'gilets jaunes', the yellow jackets every vehicle in France must carry, a massive tide of very visible protest has swept the country, initially against a rise in the tax on diesel fuel, but rapidly becoming a revolt of the oppressed against 'the president of the rich', Emmanuel Macron. 2019 GENERAL ELECTION: NEITHER APC NOR PDP! MINIMUM WAGE: N30, 000 New Minimum Wage Signed by Tripartite Committee is Payable! CHINA INVESTMENT IN AFRICA: Is China helping Africa? Youth Restiveness in Ajegunle and Lagos at Large!